In the current issue, GM Grigor Grigorov continues to examine the positions with semi - hanging pawns. As his previous article featered the main ideas we need to know when playing against semi - hanging pawns, the present article shows the reader how to use the attacking potential of such pawns. It's interesting to mention that in order to explain his topic, the author is dealing with the positions arising from the so-called Semi - Tarasch Defense. 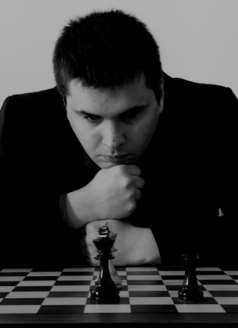 That's why besides the middlegame perspective, this article will be useful for everyone who plays 1.d4. 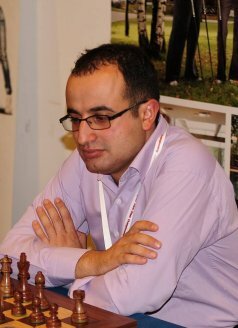 This article features one of the most important themes in chess. When we start to play chess, we learn that the rook is more valuable than minor pieces, but this is not the case every time. There are many positions in which Bishops and Knights are much more useful. That's why we should consider the fact that the strentgh of the pieces is relative. In the current article, GM Vladimir Georgiev explains a number of typical situations in which you should consider sacrificing an exchange. Once you master this aspect of the game, you will improve your dynamical understanding and of course, you will improve your level. Attacking the king has always been a challenging task, when it comes to executing it all in the right way. Everyone of us has suffered painful defeats because of his lack of understanding concerning the general attacking ideas. People are inclined to believe that the ability to calculate long variations makes them good attacking players. Nevertheless, when organizing an attack we are obliged to take into consideration a number of positional factors. In other words, every successfull attack must have a solid positional background. In the current article, IM Valeri Lilov is going to provide you with some basic concepts you need to follow when executing an attack against the enemy's king. The subject of this article is one of the most important and subtle structures - English Hedgehog. The English Hedgehog is very complex and difficult to play opening, for both sides. In the arising positions, it is important not to memorize long forced variations, but to be aware of the nuances, tactical and strategical opportunities. Positions are closed and maneuvering and usually the side who better understands the pawn structure wins the game. We are convinced that after studying this pawn structure, you will start understanding chess better. In his next part of the Endgame Series, GM Davorin Kuljasevic deals with two extremely important endgame concepts - Key squares and Opposition. 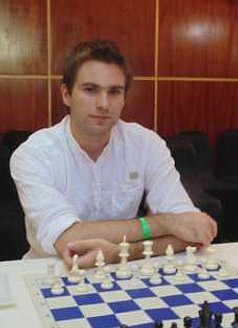 Despite the fact that almost every chess player is aware of these ideas, in practice, even strong players make mistakes. GM Kuljasevic explains the subtleties of these endings in a way that will not allow you to forget them. 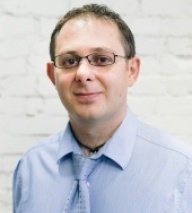 As our readers already know, in his articles, the theoretical knowledge is always connected with the practical aspects of the game. In the previous issue of Modern Chess Magazine, we have examined the basic ideas one should know when playing against semi-hanging pawns. Nevertheless, in order to draw objective conclusions about this structure, we should also be familiar with the attacking potential of these pawns. In the current article, I am going to feature some of the most typical attacking ideas in such kind of positions. As I have already pointed out in my first article concerning the semi-hanging pawns, since the central pawn is protected in this structure, the side playing with hanging pawns could effectively use the attacking potential of his pieces (he doesn't need to care about the defense of the pawn). Very often, however, we face considerable difficulties in building our kingside attack. Opponent constantly tries to reduce our attacking chance by exchanging the minor pieces while it is not easy to bring our heavy pieces (queen and rooks) into the attack. One of the most instructive ways to develop an attack in positions with semi-hanging pawns was demonstrated in the game Razuvaev - Farago (see the diagram). On the diagram, we see a typical position which arises from the Semi-Tarasch defense. Besides enjoying a considerable spatial advantage, White has comfortably developed his forces. On the other hand, Black has not even started his typical queenside play by means of Rc8, Na5 etc. Despite these considerations, it's difficult to point our a concrete way in which White could proceed with his attack. His biggest problem is to transfer his queen to the kingside. 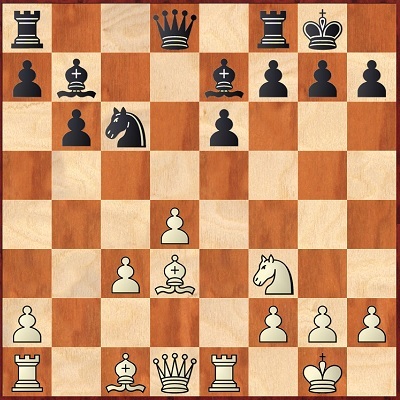 The best way to solve it consists in removing the f3-knight followed by Qg4 or Qh5. However, it's very difficult to find a suitable square for the white knight since Black controls the important e5-and g5-squares. The attempt to build a battery along the b1-h7 diagonal by means of Bb1 followed by Qd3 is not only rather slow but also closes the a1-rook. In my comments to the game Bolbochan - Pachman, I draw the conclusion that the move 13.Qc2 is also not an optimal solution since the queen is placed behind the bishop and could be bothered by Black's c8-rook. 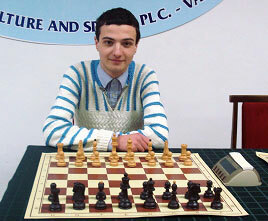 In the current game, Razuvaev introduces by far White's best attacking plan.